This week's Free GM Resource, like every week's free resource, might not be for everybody. 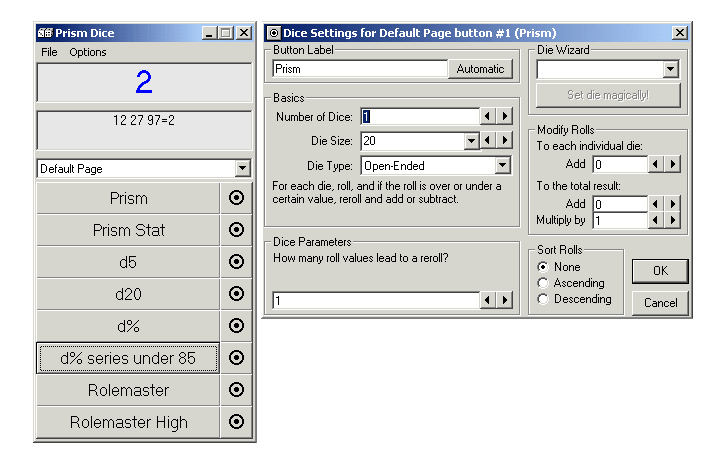 Prism Dice is an older Windows-based program that works as a configurable die roller. Now when I say "older", I mean older, as in the listed system requirements goes so far back as to mention Windows 95. Of course "old" doesn't mean useless. When installing this program there were some hiccups, but nothing that hitting the "ignore" button didn't fix. I already had a lot of background Windows files on my computer. The running program isn't that big and you can configure up to eight buttons per page. The cool part is you can simply add a page (or three) and toggle between them as needed. 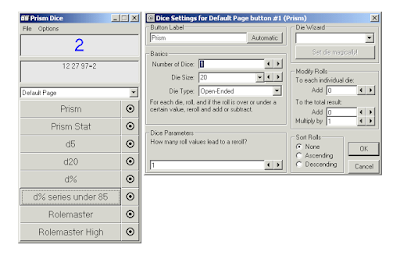 There is a lot of flexibility to the dice roller and you can easily tweak how each button/die is rolled. It won't work too well for my beloved HackMaster, but mostly because the die rules there are a bit much. By default the sound is on but you can easily click that off. Now there are a lot of electronic dice options, usually embedded in as part of another program, but I have yet to see something as stand-alone and functional as Prism Dice. I can think of lots of times I want to roll dice and not alert the players to the fact I was rolling dice. 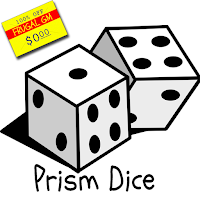 Since I use a computer a lot when I do GM, having Prism Dice can really be a useful tool. I know it isn't for everyone, but I think most GMs could find a good use or three for this program.